Students examine one of Hafez’s standing works. It's surrounded by orange life jackets. Syrian architect and artist Mohamad Hafez opened his Assembly presentation on February 17 by dividing the Hopkins community into those who hold blue passports, and those who have red passports. Born in Damascus, Hafez later emigrated to the United States and completed his education at Iowa State University, studying electrical engineering and architecture. He now works for architecture firm Pickard Chilton, has opened an art studio in Westville, and exhibits his work at local art institutions. Recently, after the American presidential election and the travel ban enacted by President Trump, Hafez’s artwork has focused on political power. Of his recent piece “His Majesty’s Throne,” Hafez has said the juxtaposition between the figure in a gold room surrounded by crowded houses illustrates “how some of us are stuck in a golden throne while the entire country and surrounding went into a demolished state, and when societies allow their leaders to perform some ‘verbal diarrhea’.” Although the work does not specifically name President Trump, the portrait is an amalgamation of nine world leaders, including hair which resembles Trump’s trademark blonde hair. In a Q&A session after his Assembly presentation, Hafez emphasized that the figure central to “His Majesty’s Throne” was not the sitting President of the United States, saying, “None of my art attacks a person’s character, I try to challenge the policies not the personalities.” As a result after discussion among Klugman and the administration, the work was not allowed to be exhibited at Hopkins. In fact, Hafez does not produce his artwork for financial purposes, nor does he sell to private investors, because he wants his art to be circulated as widely as possible in order to create conversation and convey the idea that there exists “a common denominator that makes us all human.” Head of School Dr. Kai Bynum said of Hafez’s work, “Art can capture the essence of emotions words cannot convey. 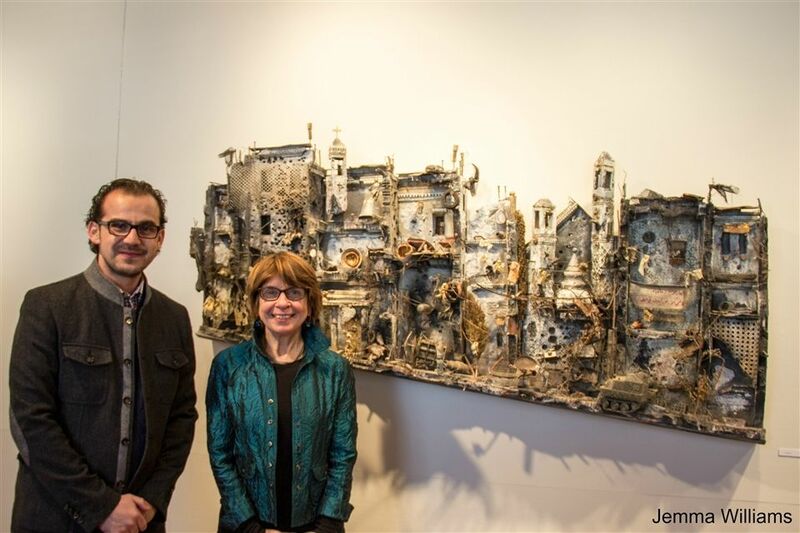 Art can humanize, and Mohamad Hafez has found a way to leverage the power of art.” Hafez’s work will remain on exhibit in the Keator Gallery through March 10.